Drafting contracts, agreements and other corporate documents is a significant element of in-house practice and a function that in-house counsel must perform well. This session will take a practical approach to contracts and drafting, including a review of the common elements of a written contract, typical clauses you are likely to encounter, the pros and cons of boilerplate and standard forms, jurisdictional issues, and other situations where your drafting skills may be put to good use. 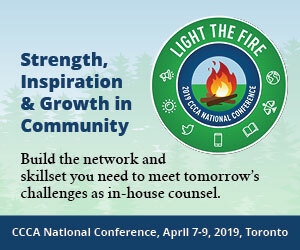 Newer in-house counsel often have little exposure to privacy matters before moving to a legal department, but according to CCCA members they are frequently assigned responsibility for privacy compliance along with their other duties. To avoid critical errors when it comes to the privacy rights of your clients, customers and employees, attend this session and find out how to comply with the law and protect your company. Corporate governance is the framework of rules and relationships by which a corporation must abide, including internal processes as well as governmental regulations and the demands of stakeholders. It takes into account systems and processes which deal with the daily working of the business, reporting requirements, audit information, and long-term goal plans. Corporate governance provides a roadmap for a corporation, helping the leaders of a company make decisions based on the rule of law and allows a company to set realistic goals, and methodologies for attaining those goals. If you're new to in-house practice and trying to get a better understanding of corporate governance � and where you fit into the big picture � our panelists will provide the answers. Employment law is one of the most challenging areas of law for any sized legal department. Our members often report that employment law and human resource issues consume the majority of their time. In this session, you will discuss common employment law and HR situations, examine critical areas of concern, and discuss strategies to help manage the HR function. S�bastien Gu�nette, Director, Legal, JTI-Macdonald Corp.
One of the most difficult parts about being in-house counsel can be figuring out how all of the pieces fit. Our final session will wrap-up the day by bringing together all of the topics covered in a very practical, on the floor level. The Basics: Limitation & Commencing Proceedings - How Long Do I Have To Make A Claim? While parties are encouraged to take pre-action steps to resolve their disputes without recourse to the courts (and many are able to).